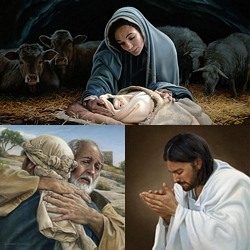 Artist Liz Lemon Swindle captures a simple gesture between mother and son in this intimate portrait of Jesus and Mary. "I created this painting because I find great joy in exploring the relationships between our Savior and the people he knew and loved," says Liz. "This wonderfully tender piece captures the great respect he had for his mother. In Aramaic, his spoken language, he would have called her 'inta' (woman) however the title Mother connects the painting more to our modern culture and language." The painting "Be It Unto Me," first in the "Son of Man" series, captured the essence of the relationship between the young mother and her newborn child. Traveling full-circle, the adult Jesus now holds his mother in his warm embrace. Even as he was dying, one of his last thoughts was for his mother's care directing her to John the Beloved with the words "Behold thy son."